Posts | NW Gàidhlig Society | An Oregon-based cultural heritage group committed to the exploration and celebration of the Scottish Gaelic identity. Few other archetypes of Scotland’s past have been romanticised more than the highland clansman that fought in the rising of 1745, and we’re likely seeing more interest in this niche of history since the ‘Highland Revival’ of early 19th-century Victorians. Unfortunately, much of our modern information regarding how the highlanders looked and lived is still very misinformed (thanks, Hollywood). However, as living historians our objective is to offer the world a true look into the past. We must adhere to every historical fact we can find, regardless of whether or not it suits our modern personal sensibilities. Fortunately, those of us who have spent much time in research and analysis find the truth to be quite fascinating and aesthetically pleasing in its own right. As a reference, I’ve constructed a list of rules and guidelines in what must be acquired to accurately portray a male highland soldier in 1745, mid-campaign. Generally speaking, a clansman who has joined the Jacobite cause as a soldier has military add-ons and extensions to their outfit, rather than all being part of an issued uniform. This list is organized in order of what we believe the brand-new living historian ought to acquire first, then continuing on to the less essential (and more easily loan-able) items. 1) A proper 18th-century shirt. This probably seems like a bland item to start out with, but it’s an important first step. Truthfully, a shirt isn’t the sort of garment you want to keep borrowing from someone’s spare kit every event! Materials: lightweight, unbleached linen (no cotton or polyester); hemp; linen-wool “linsey-woolsey” blend; lightweight wool. The length of the shirt should reach down to mid-thigh or knee. We encourage hand-sewn finishing (visible) details whenever possible. Thread sleeve-buttons are the best technique for common 18th century shirts. Metal (brass, pewter, silver) sleeve buttons are also acceptable depending on the impression. Single buttons sewn onto the fabric itself is not a British/European 18th-century technique. Gathering techniques where the body and sleeves meet the cuffs, shoulder, and collar are favored over pleating. 2) A Scottish bonnet. As hats were an essential part of fashion in the 18th century, fashion in Scotland was no exception, with the added detail that you needed something with real heft to keep you warm. The inhospitable highlands gave birth to a signature Scottish garment that has evolved to become the modern ‘balmoral hat’, or ‘tam-o-shanter.’ Tightly knit and heavily felted, the Scottish bonnet stood up to rain, wind, and snow like few other hats of the period. Most often these bonnets were dyed in blue–though were sometimes left undyed as a brown or mid grey. Mid to light shades of blue could be achieved with woad, and darker shades with indigo for those who could have afforded the pricer dyestuffs. Affix a white cockade of white silk or linen onto the side to indicate affiliation with the Jacobite army. 3) A feileadh-mòr, or plaid. The plaid was a utilitarian piece of Highland fashion that functioned much the way that bedroll blankets did in the military: worn on the body during the day, and used as a blanket to keep warm at night. If it doesn’t serve well for both purposes, it’s no good. There were many reasons why a highlander might need to travel long distances and sleep in the rough along the way, and an adequately warm plaid was essential for survival. High lanolin content in the wool also provided added protection against moisture and precipitation. Read through our article on The Case for a Drawstring Belted Plaid for notes on why we favor drawstrings on our plaids. Not a necessary detail, but convenient and (we believe) it’s a contemporary practice. Many are now under the impression that plaids had a drawstring attached to the plaid’s inside by a series of fabric strips, forming loops that would create pleats when the whole garment is lifted, all to be secured in place on the wearer with an outer belt. This would replace previous theories that the wearer would spread the entirety of the plaid out on the ground, carefully hand-pleat the garment over and over, shimmy the belt underneath it, lie down over it and belt it on. The strategy with finding a good plaid these days is to watch and wait. The most experienced Jacobite reenactors will tell you that the best place to consistently source tartan wool is Harris Tweed. This is not untrue–their cloth is outstanding, but it is also expensive, and those of us who have no option but to build a great kit on a budget have to turn to more volatile markets. Thrift stores, eBay, and indie fabric outlets rarely possess anything that looks like it came out of 18th-century Scotland, but on the off-chance that they do, you might get lucky like me and source some excellent tartan wool on eBay for $8/yard! In addition to going through the usual checklist for suitable tartan, you’ll want to make sure the plaid is a medium or med-heavy weight, especially if you’re planning on camping in it. 4) A belt. Rustic-looking leather is easy to come by in a thrift store–but a period-appropriate belt buckle usually isn’t. Check out these vendors to find a good 18th-century model you like. 5) A coat. Not all highland coats were constructed from tartan wool–many were likely made of solid color wool cloth. The distinctive part about highland coats was the length–if a coat extended much past the hip, it would interfere with the upper portion of the plaid that was often affixed to the wearer’s shoulder. Therefore highland coats were cut much shorter than the coats typically found in the rest of Britain and Europe. Sources: Hire a tailor! Contact us for references. 6) Shoes. Typical 18th-century tie shoes are the best for a common highland soldier impression on campaign. Brogues would have likely worn out after having marched many miles away from the highlands. Highland-style turn shoes (described as ‘pumps without heels’) also could have been employed for as long as they lasted on march. A vast majority of imagery depicts common highland soldiers to be wearing tie shoes. Buckle shoes are to be far less common, though seen on a few portraits of gentry class individuals. We highly encourage anyone purchasing 18th century shoes to cut the latchet strap shorter, and install ties with wool or linen twill tape. 7) Bag hose. This really goes hand-in-hand with shoes, as you can’t wear shoes without socks. Bag hose, or cadadh as they were called in gàidhlig, are hose made from cut pieces of cloth rather than hose knit from yarn. The pieces were cut on the fabric’s bias to provide elasticity, and in the highlands, were most often made from tartan wool. This along with the bonnet and plaid was a key element of the highlander’s aesthetic in many British and European eyes. Sources: You will almost certainly want to find a tailor to make these custom to your leg. These are virtually impossible to find sold by retailers, and what you would find available are unlikely to provide the desired fit. 9) A waistcoat. There are depictions of some 18th-century laborers wearing a coat without a waistcoat. Seeing as shirts were perceived as undergarments in this era, we are far more likely to have seen waistcoats forgone than an outer coat. Tartan waistcoats had the habit of being cut on the bias, like bag hose were. 10) A cravat or neckerchief. Of all the the things you can study as a historian, surviving original items can be some of the most accurate and helpful sources there are. I am aware of four bog bodies have been uncovered thus far in Scotland, dating to periods within or likely close to those featured on this blog. One was found in Gunnister, Shetland; another in Quintfall Hill, Caithness; and this fellow here, found on Arnish Moor in the Isle of Lewis. Also very common in Ireland, these types of bodies are often the victims of murder or exposure, and met a regrettable unceremonious death in a bog one way or another, only to be effectively mummified by the bog and found by peat-cutters centuries later. Everything I’ve learned about this body stems from the in-depth writeup about this find, by Helen Burnett. That article can be found here. I will however note some takeaways for living historians of this period. It’s up for speculation whether this man wore breeches, that possibly disintegrated in the bog; a plaid, which may have been stolen from him upon his burial; or simply by linen drawers alone, worn under the long shirt you see in the image above. The point is that this image probably does not paint the full picture of this man’s day-to-day outfit, as creasemarks were present on his undershirt, suggesting a garment with a waistband of sorts was worn. Remember that the climate of the Hebrides was colder than it is even today! Also, tartan is scarce to be found on this man–only on the inner fabrics of his pocket. So yes, these are the Highlands and the Islands, but let’s not be afraid of making those solid wool garments, folks! One other notable mention: cloth strips were used as garters to hold up his stockings, as opposed to a wool or linen twill tape. 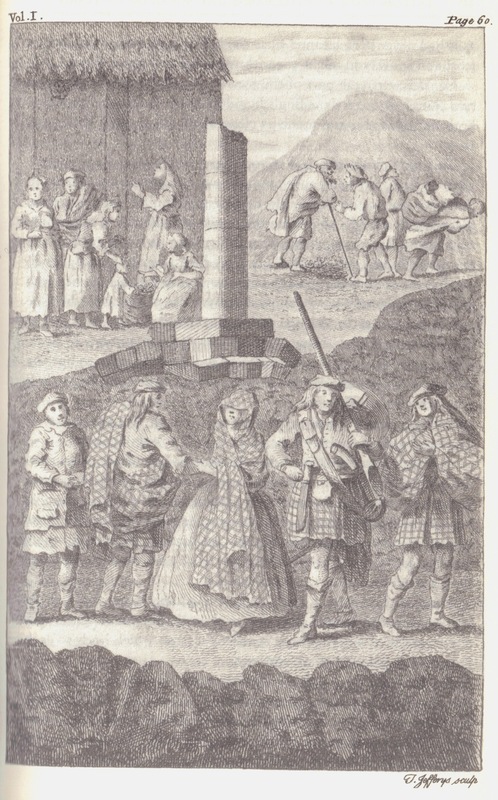 Here’s another engraving of about six or so that are included with Edmund Burt’s letters from the Highlands, and with it, more emphasis on the Highlanders. 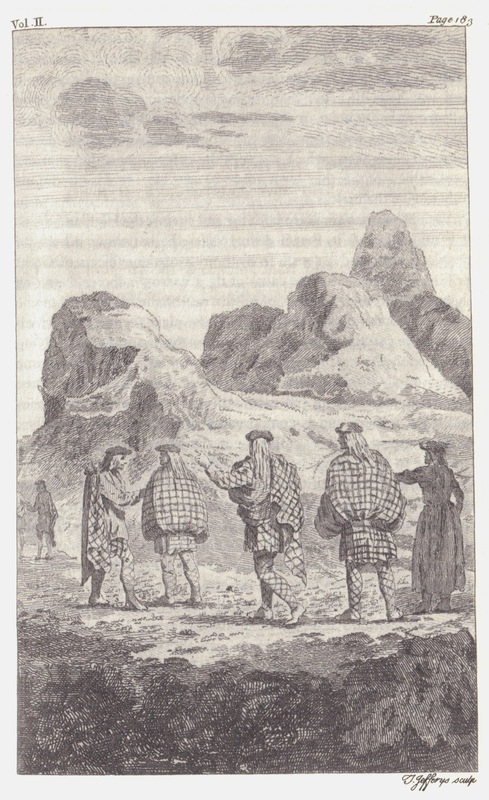 “The Highland dress consists of a bonnet made of thrum without a brim, a short coat, a waistcoat, longer by five or six inches, short holes in their brogues, though new made, to let out the water… this they do to preserve their feet from galling. …[when they] have not attendants to carry them over the waters, they vary it into the quelt, which is a manner I am about to describe. So there we have a pretty handy description of what is present in this engraving plate. All five prominent figures wear bonnets, shoes, and the belted plaid. Some wear it wrapped over the shoulders, one drapes it over the right shoulder, one affixes it to the right shoulder, likely with a button or bodkin of sorts, and another simply lets it fall down to his ankles. All are of “chequered” tartan, remembering of course that in this context, the word plaid refers to a blanket, and tartan is the design/pattern that Americans nowadays refer to as ‘plaid.’ And here our artist depicts the same sett (weaved design) for all tartan present in the picture, perhaps with some slight deviations in line thickness. Based off of contemporary accounts on how freakishly cold the Highlands were during this time, it’s probably safe to assume they are all wearing coats, although only two are really visible in this image, one a solid color and one tartan. Three wear trews and one wears tartan hose/stockings. No mention or depiction of neckwear is present here. I think the most ridiculous part of all this is that the dress described above and the individuals wearing it aren’t even the poor of the clan system being described. 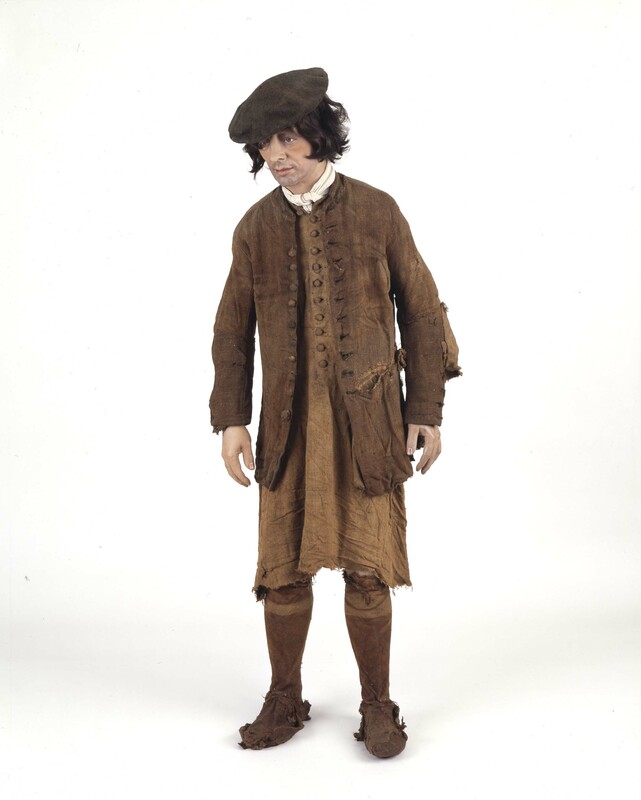 Notice that when he begins to describe the quelt (a possible origin of the more modern term ‘kilt’), he notes that this is the dress resorted to when they have no “attendants” to carry them across the water! Even more elusive than depictions of common Highlanders were descriptions of poor Highlanders, or Highland servants. But we aren’t without insights entirely–stay tuned for subsequent posts.